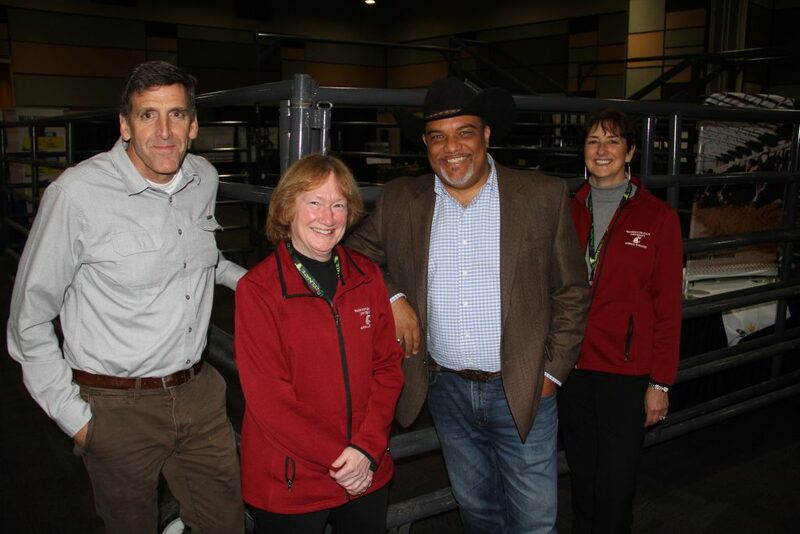 Scientists sharing CAHNRS research improving the cattle industry at the 93rd Cattlemen’s Association meeting: From left, Scot Hulbert, Interim Associate Dean of Research, Animal Sciences Chair Kris Johnson, Dean André-Denis Wright, and Professor Holly Neibergs (Seth Truscott-WSU Photo). Fostering Washington State University’s ongoing partnerships with Northwest beef producers, the Dean of CAHNRS, André-Denis Wright, joined faculty, students and alumni from the Department of Animal Sciences at the 93rd annual convention of the Washington Cattlemen’s Association, Nov. 8 in Kennewick. WSU animal scientists shared the latest research and growth, and welcomed new partnerships to advance discoveries, student experiences, and a more profitable and sustainable industry. 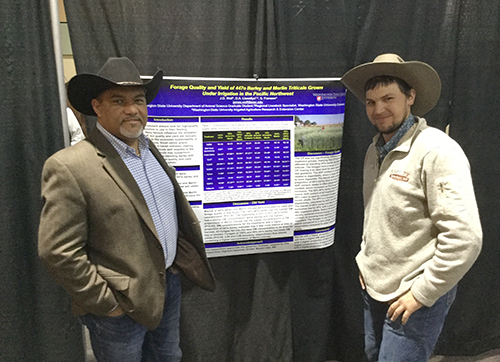 CAHNRS Dean André-Denis Wright visits with WSU Animal Sciences student Jamie Wolf about his forage research at the 2018 Cattlemen’s Association convention. Speaking to the convention, Wright shared his academic journey around the world and to CAHNRS, offering highlights from his own research exploring wild microbes for better nutrition, increased body weight and decreased greenhouse gas in livestock, including cattle. “I feel truly blessed to be here, to make a difference and help agriculture, natural resources and human development in this state,” said Wright. Supporting animal sciences and industries is a priority, said Wright, who invited producers to join him in dialogue on student involvement, a vision for the department, and how CAHNRS and industry can work together. CAHNRS faculty continue to advance the industry through research. Scientists Kris Johnson, Don Llewellyn, Martin Maquivar, Min Du, Holly Neibergs, and John Wenz shared updates on their efforts to improve fertility, forage, nutrition, reduce emissions, and fight disease. With a large and growing enrollment, “Animal Sciences has a lot of excitement,” said Johnson, department chair. Students come from 14 states to study animal sciences at WSU, and the department is seeing increased interest in animal management, preparing the next generation of employees and leaders for a growing industry. “Experiential learning is critically important,” said Johnson. Students are traveling and working on projects internationally, learning about animal sciences in other countries through two week visits to Costa Rica. A new trip to Ireland is planned for summer 2019. CAHNRS researchers sharing their projects at the convention included Don Llewellyn, Holly Neibergs, Martin Maquivar, and Min Du. Animal Sciences students are now part of national meats judging team competition in partnership with the University of Idaho, and Llewellyn is restarting Cougar Cattle Feeders this fall, in which students raise donated animals for scholarships, experience and education. She welcomed producers to contact her to learn more about student interaction. Learn more about the Department of Animal Sciences here.